Commercial silver cleaners are cheap, but they tend to be filled with harsh chemicals that I prefer not to use around the house. Fortunately there is a way to safely clean silver using common household products that you have in your pantry right now. Hurray for baking soda! It is such a heavyweight when it comes to uses around the home. This method of cleaning silver works wonders even for heavily tarnished pieces as long as they can stand up to a little heat. First, bring a large pot of water to the boil on the stovetop. Make sure that the pot is large enough to fit all of your tarnished silver items. Don’t overfill the pot (leave at least two inches of space at the top). When the water boils, remove the pot from the heat. Place a piece of aluminum foil into the bottom of your pot, and place your silver items on top, immersed in the boiling water. Start shaking baking soda into the pot. It will foam and bubble, and you’ll notice a sulfuric smell, like rotten eggs. The chemical reaction will (almost magically) remove the tarnish from your silver, as the tarnish will become attracted to the aluminum foil instead of your silver piece. Keep sprinkling in more baking soda until your silver is shiny and clean or until the liquid no longer foams. The water has to be really hot for this to be effective, but if you do it correctly, it works like a charm on tarnished silver. I’ve actually found this to be the best method for removing tarnish from vintage silver, as it is more effective than many silver polishes I have used. It even gets into the nooks and crannies where you wouldn’t be able to hand-polish the tarnish away. Once the tarnish is gone, wash the silver with gentle soap and water to remove the rest of the baking soda. If there are a few spots of tarnish left, they should wash off when rubbed gently with a soft cloth. If you have silver jewelry set with gemstones, I would hesitate to use this method, as it may cause damage to some gemstones. You might want to take your jewelry to a professional jeweler to have it cleaned. However, this method works well for silver platters, flatware, bowls, chains, serveware, and many other silver or silver-plated items. Many articles on the Internet recommend scrubbing your silver pieces with toothpaste, table salt, or baking soda. The reason toothpaste, salt, and baking soda work is because they are abrasives, but while they may scrub away the tarnish, they are also rubbing scratches into your silver, and in the case of silver-plated items, they may start to wear away the silver finish entirely, exposing the base metal. Nevertheless, I have been guilty of using a baking soda/water paste to clean a few inexpensive pieces of silver jewelry. While professional silversmiths might be horrified, I find that it is worth it to me to have a clean piece of jewelry that I will actually wear rather than a tarnished-but-undamaged piece that sits in my drawer for years. Antique silver plate and good-quality silver jewelry may lose much of its value if cleaned improperly. If you have a valuable silver piece and you are in doubt as to how to clean it, it may be best to bring it to a professional. How do you usually clean your silver? Which method is the most effective? I use the silver polishing cloth they give me when i get the jewelry. It works well, but i HATE that it turns black and I can't wash it. Good article! Will def have to try this. My problem is, I am a very disorganized person and I always, without fail, lose that cloth. But they do work well. I find that it helps to tear the foil up in smaller pieces and swish the silver (plus tarnish, which is silver + sulfur), aluminum, and baking soda around so that all of those ions get in touch and react. (The baking soda and water connect the aluminum and silver. The aluminum grabs the sulfur in the tarnish and leaves the silver on your silver piece.) I also prefer to do this in a big pyrex bowl so that I can see what I'm doing and don't have to think about what my pan is made out of. Thanks, those are useful tips! Be aware that getting in the nooks and crannies pretty much obliterates the antique value. It makes the silver look very clean, and new. It is akin to refinishing an old piece of furniture and destroying the antique value added by the wear and patina. If you like the way the design is emphasized by the aging process, then use traditional silver cream, and rub, rub, rub! It's a matter of preference. I might use this posted method for my contemporary silver plate serving utensils, but never for great grandma's silverware. Anyway- pretty cool! I have seen this done, but never remembered how to do it. Thanks! Thanks for that tip! You're right, I wouldn't use this method for a truly valuable antique. But I do use it to clean up silver that I'm planning to eat off of =). Maybe it's just me, but eating off of tarnished silver = ick. I'm glad you mentioned silver cream. It's not supposed to be as abrasive as other rubbing methods, but I'm not sure how "natural" it is, so I didn't include it here. Great tip! How much baking soda do you end up using? For a few other non-abrasive and natural ways to clean your silver, you can try powdered milk, or banana peels. No, seriously! I think I end up using between 1/2 cup to 1 cup of baking soda. It depends on how seriously tarnished the item is, and how much water is in the pot! Your article mentions baking powder and baking soda. Sorry, it should be baking soda. Typo on my part! Thanks for catching this -- the error has been fixed! I decided to use my great grandmother's silver for Christmas dinner. I don't plan on selling it so I might as well use and enjoy it. It was tarnished though and I did not want to eat off of tarnished silver... not appetizing. I tried this and it worked beautifully! It eliminated 99% of the tarnish on a set of silver that is at least 60 years old and that had been in storage and unused for at least 20 years. This was completely enthralling for me. I have always loved silverware and my mom always vacillated between how to clean her set but usually made me and my sister help her do it around Christmas time. I have my heart set on a Tiffany pattern now, but have only one piece so far which I see I have been cleaning the wrong way. Thank you for this, it made my day! Also got a question for you, if you can please help!! Is it safe to clean silver with baking soda, salt, boiling water and aluminum foil?? I heard they turn white. Is it so?? Worked for me! No more purchasing Tarnex or anything else when this worked perfectly. Can I use the boiling water, baking soda, and aluminum foil on a silver plated tea service? Did not wait for an answer. Went ahead and tried the soda, boiling water, and aluminum foil on my silver plated serving. It worked like a dream. I am still in shock at how easy and fast it was and how clean it came. The detail came out clean also. I think there is a difference in patenia and tarnish and I wanted the tarnish off. Great tips indeed ... It is great that you are sharing natural cleaning solutions, not expensive commercial agents. I spoke to a professional and he said explicitly not to use baking soda. Be VERY, VERY, VERY careful using this method. It is effective on very good quality silver plate and sterling silver because you don't see the bits of silver that come away with the tarnish. Less expensive pieces of silverplate can be permanently damaged - I know from personal experience!! I learned too late that this method is also very harsh and actually removes silver along with the tarnish. I ruined 2 peices that were wedding gifts as well as a few trays and a coffee pot. I used this method for a long time and it wasn't until a few of peices didn't want to come clean that I spoke to a silversmith who told me that my items were ruined. The only way to save them would be to re-plate and it was not worth the cost. I investigated further and learned that the information from the professional was indeed correct and most professionals will tell you the same thing. A good quality silver polish is still your best bet. Tarnex and similar products are also very dangerous and also cause permanent damage. Good quality polishes cost a bit more and are available at jewelers, hardware stores and specialty stores. Do not trust the bix box retailers. Those old-fashioned polishes with a bit of elbow grease will ensure that your silver will stay beautiful for your grandchildren. There's a reason our grandmother's silver is still around today!! There are many excellent uses for baking soda - and I use it for many things myself - but cleaning silver is not one of them. 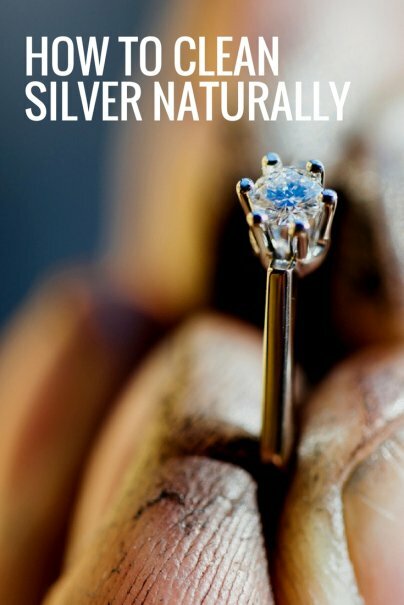 Professional jewelers won't service anything they didn't make and the silver cloth, while effective, is no good if you have respiratory issues. Tried this on .925 silver ring from an that was a great resale find. It already had fine scratching , so what's the harm? In deference to the size difference I lined a large bowl with foil and poured from my water heater . Also substituted baking soda that's for odor control( different size granules). I recommend anyone who wants to preserve any detailing or small amount of patina pull the item out before it looks done and rub the rest off with cloth, as I took a little bit of character off my bargain find. Rinsed it and dipped it in bottom shelf vodka, an excellent disinfectant and jewelry cleaner. The antique earrings I found were vodka dip only, for instance. Thanks for posting! Great advice and tips. I soak my jewels regularly in Windex-at least once a week and then use a toothbrush and the hottest water I can get. Nothing beats a professional cleaning though. The difference is amazing!!! This write-up does not tell you how long the silver should be left in the solution. Beware that this take only a few seconds to work! After following these instructions (and guessing how long it would take) I too ruined an antique, based down to me by my great grandmother, because I left the piece in the solution too long and it stripped the silver right down to the base metal. Doing a "test" on a piece that holds no value would be a prudent thing to do. I learned that the hard way. Avid DIY-er featured on ApartmentTherapy, GoodHousekeeping & CountryLiving.